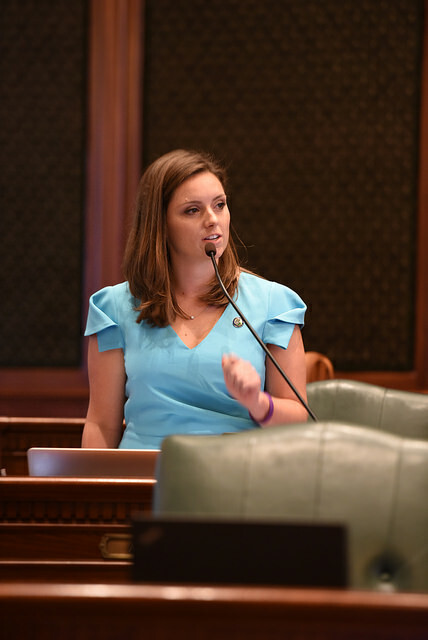 In response to the teacher and substitute teacher shortage in Illinois, State Representative Avery Bourne (R-Raymond) signed on as Chief Co-Sponsor of House Bill 5627. The legislation will make it easier for educators coming from other states to teach in Illinois and to make it simpler for substitute teachers to meet licensure requirements. · Creates full reciprocity of out-of-state applicants for a Professional Educator License (PEL). This will allow out-of-state licensed educators to teach in Illinois without meeting additional requirements. · Makes an individual with a PEL eligible to substitute teach without a Substitute Teaching License, enables an individual with a lapsed PEL to be able to substitute teach, and provides that any individual who has completed 60 credit hours of coursework is eligible to receive a Substitute Teaching License. · Provides that an Alternative Educator Licensure Program should be a one-year program instead of a two-year program. · Clarifies that professional development may be completed at any time during after issuance of the license. On April 6th, Governor Bruce Rauner signed Senate Bill 863 into law. It is another piece of legislation that will address the teacher shortage by making it easier for teachers with out-of-state credentials to get licensed in Illinois. The new law also alleviates an immediate problem for a significant number of schools who hired out-of-state Speech Language Pathologists (SLP), only to find that the state’s licensing process was prohibitively burdensome. As a result, many of the SLPs could not begin work. The two provisions allow for out-of-state teachers to become licensed in-state by  providing evidence of completing a comparable state-approved educator prep program, or  holding a comparable and valid license with a similar grade and subject credentials from another state.